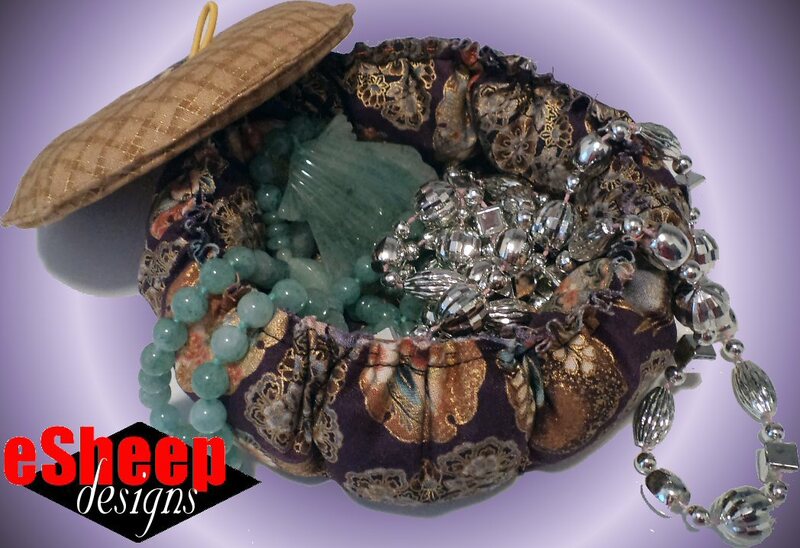 Make a charming basket out of a couple of discarded CDs! I'm not exactly overrun with CDs that need to be repurposed, so this project more or less uses up the last ones that are cluttering up my space. In a very pretty way, I might add. As I found out before deciding to upcycle CDs into coasters, there aren't a whole lot of simple ideas for reusing CDs, as is. Most of them involve breaking them up into small pieces. So when I came across a variation of this basket on icreativeideas.com (direct link at the end of this post), it jumped out at me. CDs are used to form the lid and the bottom of this basket. You'll also need some polyfil (mine was left over from my P&P pillow project). Fabric-wise, you can make one basket with a fat quarter. A button and an elastic hair tie completes the list of required materials. The name? Well, if you make more than one basket, you can stack them together! Make two baskets and stack them together! 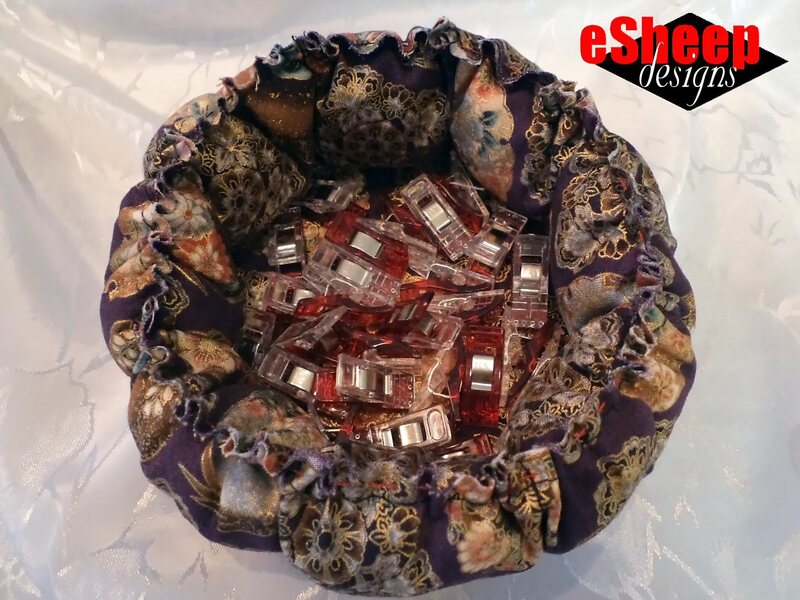 There are loads of possibilities for how to use this fancy little fabric basket. In the photo at the top of this post, I've put some jewelry selections in it. It would do well in your guest room to hold candies and mints. 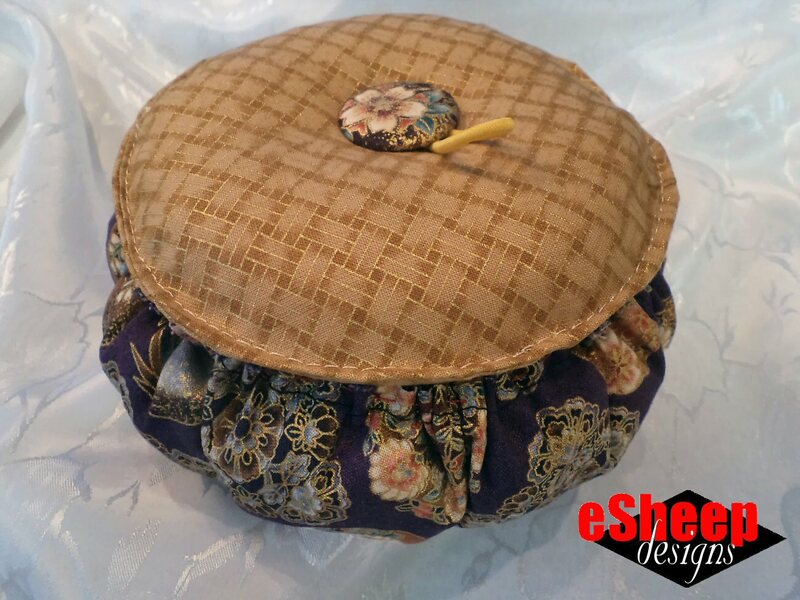 In the sewing room, you can use the stacked version to store clips, buttons, and other small bits that are relatively lightweight. In terms of this set, one is being used as a thread catcher. The one with the lid is in my bathroom, holding various chargers and cords for my cell phone, mp3 player & speaker. Do you find yourself charging your gadgets in the bathroom overnight? The original project was hand-sewn. You don't need to be reminded again of how much I dislike sewing by hand (although I just did remind you), but for those who share my sentiments, let me say that I have transformed this into a machine sewn project. Establish where the middle is on the wrong side of one of the fabric circles and place your first CD there. Top with the other fabric circle, wrong side down. Place the other CD on top to guide you in pinning through both layers around the first CD, trapping it between the two fabric circles. Use a fading marker to draw a circle around the CD; that will be your sewing guide. Pin around the outer edge as well. Carefully stitch around the CD. A cutting mat comes in handy here: use pins along the edge to divide the circle into eight equal parts. The next step is to sew from the edge of the CD circle to the outer edge along those divisions. If you need to make actual sewing lines, go ahead and do so; I can usually just follow my pins. Once you have the divisions sewn up, cut appropriately sized pieces of polyfil and stuff them into the resulting "pockets". You don't need a whole lot of fill to make this work, so don't overdo it (as it might make your next step unnecessarily tricky). The next step is to close up the circle — and the stuffed pockets — with a 1/4" (6mm) seam allowance. (Definitely pin the edges closed first, before you start sewing.) If your fabric is especially prone to fraying, you might want to follow up by zigzagging the raw edge also. You have a choice as to how you want to do the next step. 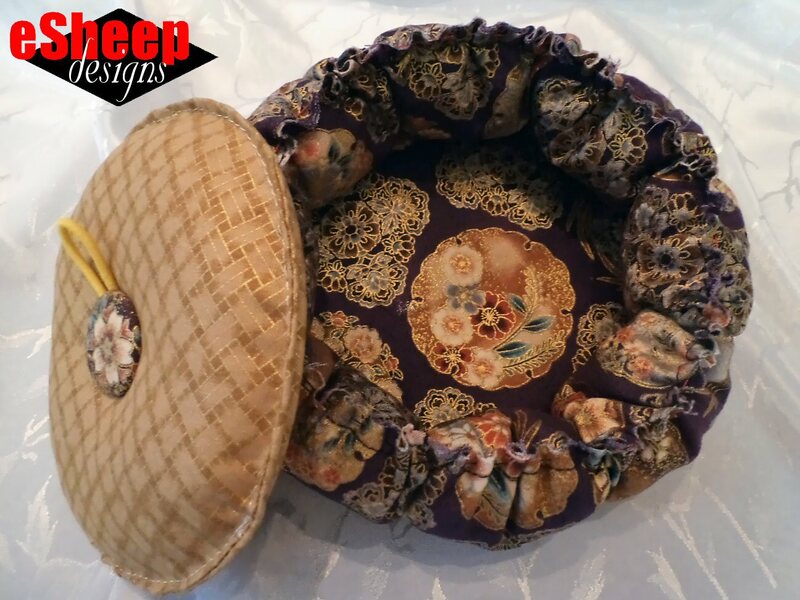 I sewed the gathering stitches in by hand onto the top edge of this basket, but you can also machine baste — just be sure to use a high quality, strong thread — and then pull the threads afterwards to gather. When it comes to deciding how much to gather, place your remaining CD on top as a sizing guide. The finished lid will only be a tiny bit bigger. The basket part is done! Tie off the gathering stitches appropriately and you already have a functional basket! In fact, as a thread catcher, this is enough; you don't really need a lid. 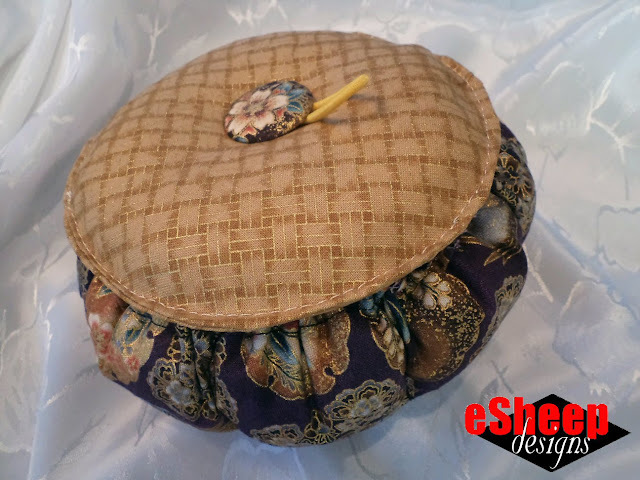 I had a fabric scrap that was perfect for the lid, but wanted some way to tie it back to the main part of the basket. I decided to cover a button with the main fabric. 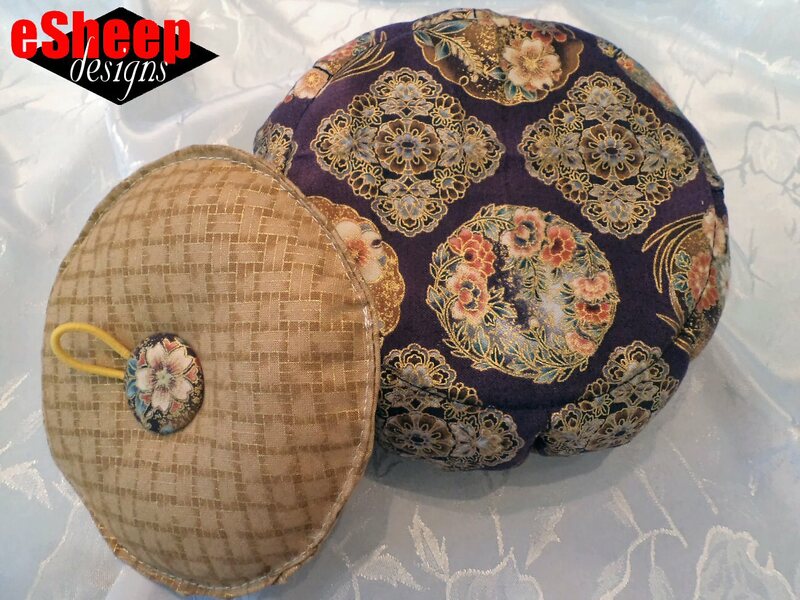 Cut two fabric circles about 3/4" or 2cm larger than the CD. With right sides together, sew around the perimeter with a 3/8" or 1cm seam allowance, leaving a large enough gap to slide in the CD. Turn right side out and give it a press. Use the CD as a template to cut a piece of polyfil about the same size and then stuff both inside of this fabric "pocket". Use clips to help you keep the turning gap closed, and then carefully — very carefully — topstitch around the entire outer edge... avoiding the CD, of course. What might you use these stacking baskets for? That's it for this week. If you're interested in taking a look at the original inspiration behind this project, you can find it here. Like it? Want to keep it? For a copy of this tutorial in PDF format, go to my Makerist shop and download it for free! Great tutorial, thanks for sharing it Rochelle. That is clever!!! I love your baskets, Rochelle. They'd be perfect for potpourri - yes, I still use it. The CDs makes for a sturdy lid and a flat bottom on the basket. 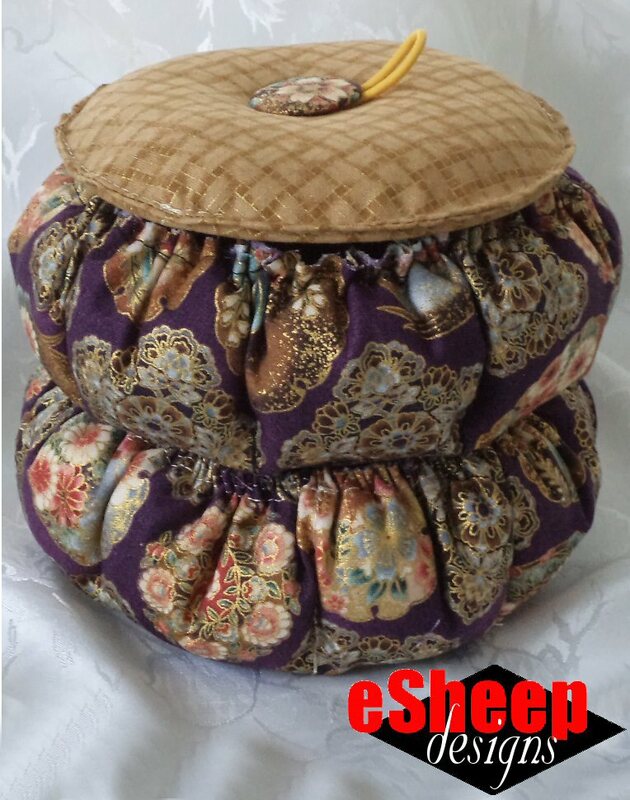 I'd love you to add this to the Fabric Baskets linky. I am amazed! This is so cute, and who doesn't have some old cds around the house. I love this idea, and who would ever guess what it was made out of! Thanks for stopping by, Sandi! Hope you have fun making these and find great uses for them. Great idea. Lots of possible variations running through my brain. I'd like a way to attach the lid so it flips open. (Easy to imagine losing the lid otherwise) I used to have many old disks around waiting for inspiration- hope I can find them! Hi there and thanks for sharing your thoughts. I think I've seen similar situations covered off by a small length of ribbon. 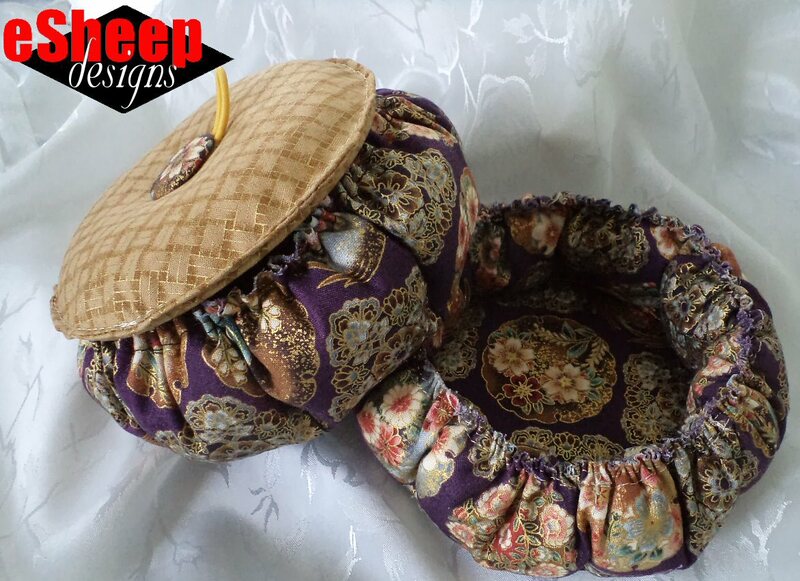 It could be sewn into the rim of the lid and then attached to the basket in some way. De nada. Me alegra que te guste!